Drawing favourable comparisons to Wolfstone, Afro Celt Sound System, Trans-Siberian Orchestra, symphonies, and Japanese taiko groups, and consistently providing performances from Grade 1 bagpipers and other world class musicians this American/Canadian group has electrified audiences on three continents for many years. They have added to their ever-growing family of fans at music festivals, theaters, Highland Games, military bases, renaissance festivals, clubs, weddings, memorial ceremonies, and corporate events -- anywhere that presents top-quality, high-energy music. This has even included shows with world-renowned violinist/composers Lindsey Stirling and Alison Krauss, as well as airplay on TV and radio, and shows at non-Celtic venues such as the World Music Festival in Quebec, Canada where they kicked off the 6 day event to widespread acclaim (they've played this festival 6 years in a row and counting). In 2017 they became the "St. Paddy's Band" of Rogers radio stations nationwide when they recorded Celtic versions of contemporary songs for airplay, 2018 saw them perform at festivals in Scotland including one of the largest Highland Gatherings in the world, and 2019 will see them begin appearing with international artists Japanese taiko group, Nagata Shachu. Their hard won road successes have established them as artists with bona fide international acclaim. 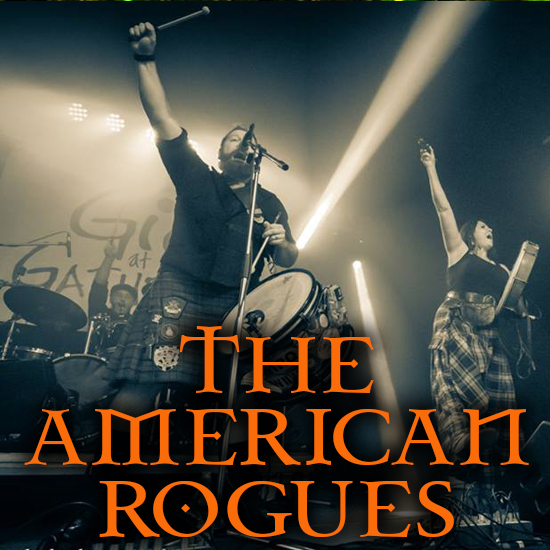 Renowned for their musical skill, quick wit, compelling storytelling, and engaging stage show the AMERICAN ROGUES have mastered the art of creating an immediate connection with audiences who can't stay in their seats. They are equally known for their epic, multi-instrumental sound that crosses the musical landscape to include jigs, reels, hornpipes, ballads, originals, covers, soundtracks, patriotic and military music, Irish foot-stompers and more. The AMERICAN ROGUES are fast becoming a household name with music lovers around the world, loved by young and old of all backgrounds. Why not add a meal to your show? Our incredible buffet are the best values in town! Make sure to add it to your cart when checking out by clicking the button above.